The FX market is certainly flashing different signals than equities. The yen was the top performer this week in a potential sign of risk aversion. That said, the Swiss franc was near the pile so flows are likely a bigger part of the story here than fundamentals. At the bottom of the pile was the New Zealand dollar after a surprising drop in Q1 CPI. The overall moves are a bit of a surprise because it felt like a quiet week. However many currencies were jarred by various one-off factors in quick moves. 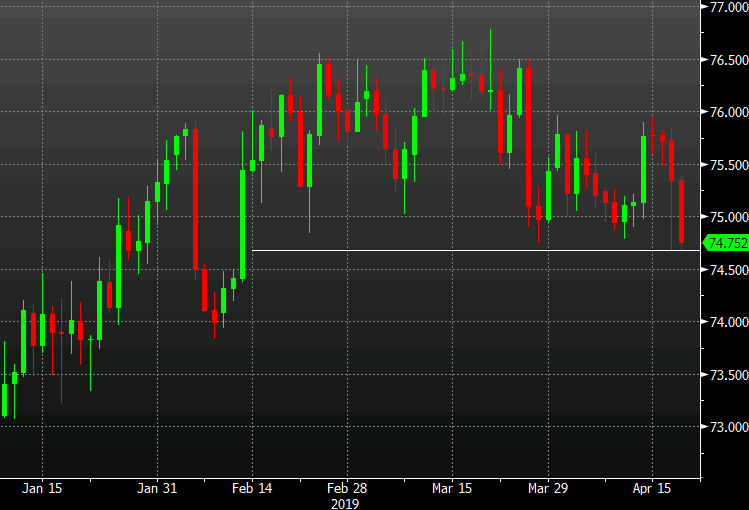 Techncially, NZD/JPY is in the midst of a technical break below its recent range. On the CPI numbers it fell to the lowest since Feb 13 and we're revisiting that area now after a failed bounce. A break could easily be on its way to 74.00 or worse. The sluggish data from Germany and overall Eurozone PMIs are spreading jitters across markets as haven flows start to dominate once again. 10-year bund yields are down by 5 bps to 0.03% while Treasury yields are seen slumping by 4.5 bps to 2.548% currently. And in the currencies space, that is helping to keep the likes of the dollar, yen and swissie bid on the day. All major currencies are close to session lows currently against the three currencies mentioned as haven/risk-off flows start to dominate proceedings. According to Markit, they view that the Eurozone economy should only grow by 0.2% in Q1 2019. That's really awful and it is just going to spread more fear on global growth worries. Much like the reports on ECB doubting economic growth earlier this week, the German data earlier basically highlights the fragility of the recent rally in the euro. While the manufacturing print improved from March to April, it's the sheer disappointment relative to expectations is what markets are focusing on upon the release. EUR/USD is sent lower as a result from 1.1290 levels to a low of 1.1265. More significantly, price is looking to hold a break below the 200-hour MA (blue line) @ 1.1284 now. A break below that will see the near-term bias shift to being more bearish again. Despite the overall improvement in German PMI data from March to April, the manufacturing sector continues to be weak (contracting for a fourth month in a row) and that's enough to put a drag on the euro and bund yields considering that factory activity is the backbone that drives the German economy. For EUR/USD, it looks like sellers are back in near-term control and that bodes ill for those looking for an upside extension as we look to wrap up the week. Further support is now seen near 1.1250 before additional support at 1.1215-20 comes into play. Following which, bids at the 1.1200 handle will be called upon next. Yesterday's run higher failed to culminate into anything meaningful as buyers failed to secure a daily close above the 200-day MA (blue line). Today, that level rests at 0.7190 and will be a key point of contention once again as price lingers around 0.7180-90 levels after touching a high of 0.7199 earlier. The high came after the release of the Australian jobs data for March which showed a jump in employment figures but the unemployment rate crept slightly higher since February. The data failed to offer much to market participants in general as it didn't show the kind of decline sellers are hoping for to price in a RBA rate cut further. Hence, it is suggesting markets to 'carry on as you were' to prior to the data release as we will have to wait on more clues before being able to find firm direction based on fundamentals. From a technical perspective however, the 200-day MA highlighted above remains key and any firm daily break above that will represent a significant change in AUD/USD bias (reverting the bias back to the upside). That being said, over the next few sessions, it's best to be aware of thinner liquidity conditions with Australian markets among those set for a four-day weekend. I never trust breaks that happen during periods on thin liquidity and the flash crash on 3 January is a prime example of why that is the case.